While Red Door makes every effort possible to screen our tenants and go the extra mile to avoid potential problems, it is inevitable that some renters will just have to be evicted for one reason or another. Sometimes families that are well-qualified when they move experience life altering circumstances that will result in them no longer being able to meet the obligations of the lease. It may be a job loss, death in the family, reduction in work hours, divorce or a number of any other unfortunate situations that might cause an eviction to take place. When a tenant fails to pay rent, the only legal action we can take is take the tenant through the eviction process. Typical evictions cost between $800.00 - $1500 and are borne up-front by the owner as an expense. In a usual case, owners pay for the eviction up-front and are later compensated by the refund of the tenant security deposit. However, in most cases, if the tenants are behind on rent prior to filing the eviction, the security deposit is unlikely to fully cover all of the unpaid rents plus expenses not to mention any repairs that will be needed to get the property rent-ready again. 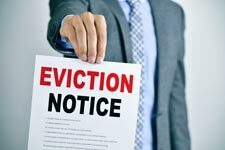 If you are enrolled in the Eviction Protection Program, Red Door Property Management will assume the up-front financial burden of the eviction as a company expense, not to be charged to the owner like all other property management companies. Our Eviction Protection Program changes that. Court costs and eviction fees that are usually borne as an up-front owner expense are no longer of concern for you. Our Eviction Protection Plan (EPP) will cover the cost of almost all evictions. This could save you more than a few hours of worry or lost nights of sleep wondering about how to pay for an unexpected eviction while your tenant is not paying rent. Red Door Property Management will file for eviction on your behalf, as usual, but RDPM will also assume the up-front financial burden of the eviction as company expense, not to be charged to the owner. That means in most cases you will end up paying nothing out of pocket for the eviction! By enrolling in the EPP, security deposits can be preserved and applied directly to your lost rent and damages as you would expect. Red Door property management pays for your eviction in full, and as a result, the security deposit is available to be applied towards your unpaid rent, property damages, or any other fees you are entitled to recover from the tenant. Evictions must be for cause (i.e. non-payment of rent), and cannot be owner caused.